Office partitions are often seen as plain, boring cubicles that promote a depressing working environment. In fact, they can make an office a significantly more pleasant working space when they are used correctly. Intelligently partitioning an office, offers flexible options of harmonious integration between employees as well as the equal divination of the available work space. 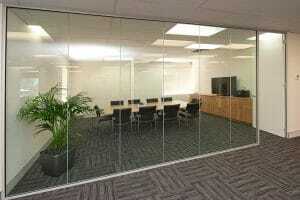 Office partitions provide a completely different level of privacy to an open plan office. They establish separate sections within the office creating individual spaces that employees can personalise. As well as this, they allow staff to focus on their own work without distraction, and to take phone calls/hold meetings in a professional manner. Wall partitions are also excellent for noise reduction by minimising external distractions especially when the partitions are full-height. This can be important if you’re constantly holding private meetings or if you’re spending a lot of time on the phone. Contrary to popular belief office partitions don’t have to be dull, grey office cubicles. Partitions can actually enhance the overall aesthetic of the office and create a unique style. We provide a huge variety of custom made partitions that range in colours, finishes, styles, sizes, and materials. The size of the office dividers can be specified, running from floor to ceiling or from wall to wall as desired. They can modernise an older style office and add a touch of class to the interior design of the space. As such, a well-partitioned office can become a much more attractive place to be. Glass partitions are an excellent choice for maximising the significance of natural light. This gives the office a more positive, welcoming feel as well as lowering energy costs. The glass partitions in place of walls also has the added impact of making the office seem more spacious and inviting to guests. On the other hand, partitions can be a great way to block unwanted light from the sun that can heat up an office or become distracting. Office dividers make excellent sun screens and allow employees to stay clear of the sun without having to close blinds and darken the whole office. Office partitions such as; wall partitions, glass partitions, wall dividers and glass dividers are a far more cost-effective way of dividing an office than installing permanent walls. It’s a lot less of a dramatic measure to segment your office areas, than going to the expense of building fixed walls. They are also practical, as any future expansions or rearrangements are far easier to deal with when you only need to remove temporary screens. You will also save money on refurbishment and cleaning costs as partitions are very easy to clean and can be fixed or replaced at a fraction of the cost of permanent walls.